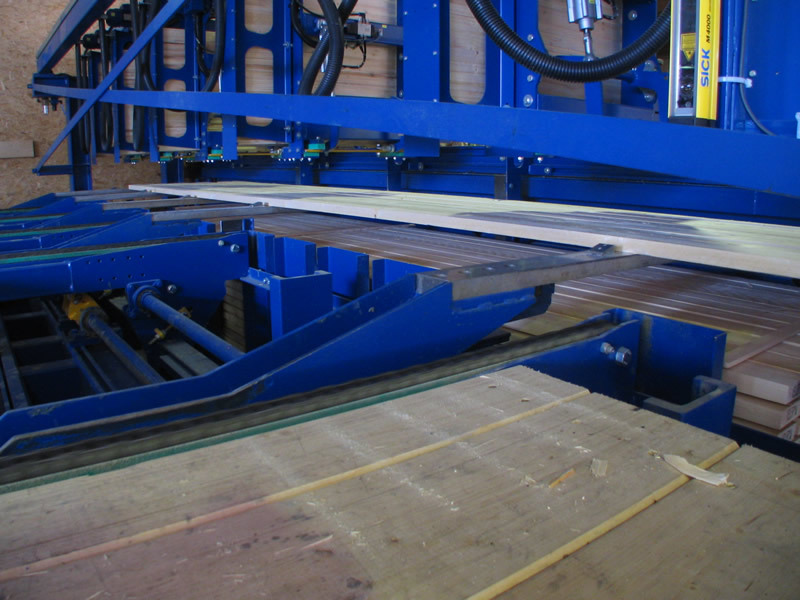 Our fully automatic stacking systems guarantee a continuous outflow of material from the planer or sorting line so that no downtimes occur at upstream units. According to the required output our stackers are equipped with stack tongues or with vacuum lifters. In both versions, the timber is collected into layers and placed on the stack to be formed layer by layer. The stack is lowered by the respective layer thickness so that the upper edge of the stack is always kept at a constant height making it easier to place the next layer. 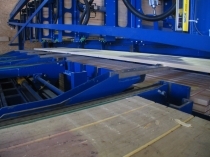 To reduce the stack change time – the time after completion of a stack until the start of the stacking of another – we offer integrated intermediate lifting tables to make stacking a continuous process; idle times are thus avoided. Stacking with random widths: The board widths are measured before layer formation and compiled according to the maximum width of a layer. Stacking with gaps: When placing the layer, a defined distance (“gap”) is generated between the boards so that all layers feature the same outer dimensions and the stacks thus have a closed outer appearance. This can also be done when stacking random widths. Stacking with diagonal offset: Each layer is diagonally offset from the underlying layer. This increases the stability of the stacks, particularly in a subsequent internal transport within the mill.